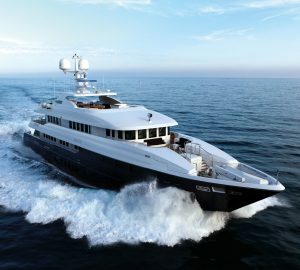 50m Heesen yacht Inception with outdoor cinema, bar, dining areas and luxurious accommodation for 12 guests. 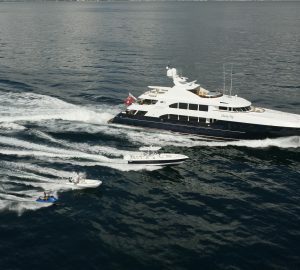 Inception charter yacht takes everything to extremes, in a good way of course. 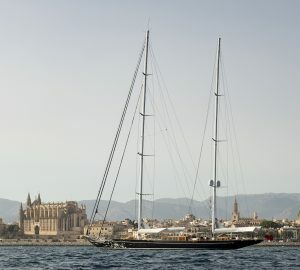 It has huge outdoor spaces and is a classic, elegant looking superyacht. It’s 50m, 164ft, long with a massive sun deck that has a Jacuzzi which can fit 12 people into it easily. 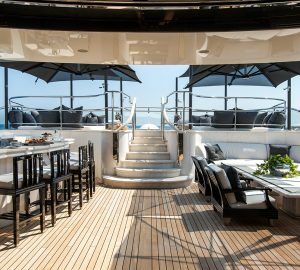 The teak terrace, with an automatic clamshell awning on the foredeck, converts into a fantastic outdoor cinema at night. 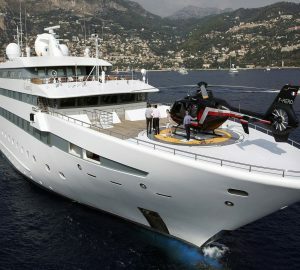 Inception was delivered in 2008 and will certainly make your yacht charter vacation the best ever. With her six cabins, a circular master suite with sun terrace and an infinity pool, there is no better vessel to sail away into the sunset on. The VIP suite takes up the full beam and even has a hidden unfolding balcony to sunbathe or dine on. A striking superyacht indeed both outside and inside. The arched, low profile, stylish lines of this splendid yacht showcase many features and unique designs. Inception was created to accommodate young, active families as well as couples, single travellers and groups of friends. She still has an aura about her which is due to the contemporary styling and many other original features. The interior was designed by a Michigan company that produced a modern Art Deco form throughout the vessel. 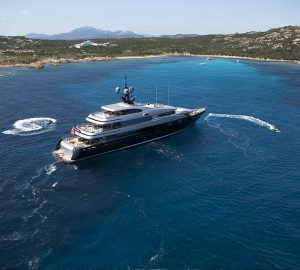 Check out the bold colours, sharp lines, chrome accessories and layered lighting to see a fabulous superyacht at its best. Designers chose dark Macassar ebony as the leading material. This is complimented by stunning cream fabrics, steel accents, a huge variety of light fixtures and beautiful furniture. In the main saloon, you’ll find a formal dining table, a bar and comfortable lounge area. At the bar take in the splendid white onyx under-lit in blue counter and the metallic stools. An LED hand blown glass wall sculpture overlooks the well-polished ebony dining table, now that sounds impressive. There’s also a study which converts easily into a massage room forming part of the main deck. The steel spiral staircase will certainly catch the eye. It looks as though it’s floating on air, a remarkable feat of craftsmanship to say the least! The master suite and a private office are situated across the upper deck. Enjoy 180 degree views from the state room through the floor to ceiling windows that make this room bright and light. How about this? A rotating bed can face the TV or the private aft deck, now that’s technology with a twist. Another high point is a spa pool on the terrace with lots of seating and sun beds. There’s a delightful VIP suite too on the main deck. The corridor floor to this suite is absolutely remarkable with dark river pebbles laid under plate glass which continues up the wall. Four staterooms on the lower deck are decorated in vibrant colours and patterns complimenting the dark ebony. They offer an alternative to the monochrome décor of other areas of the vessel. One double cabin has been decorated in vibrant pink, orange and lime while the other combines teal and gold to give a warm, ambient atmosphere. Omega Architects designed the spacious decks to be near enough the same size area as the interiors. 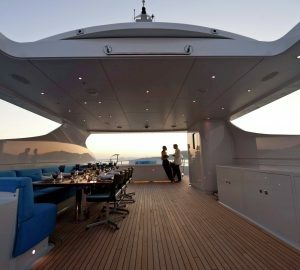 They also managed to use up every inch of space to create a superyacht that guests could totally relax on. The front of any vessel is usually left untouched, however on board Inception you’ll find an array of lounging options. Chill out on one of the sun loungers or under the magnificent awnings and watch the world go by. Dine al fresco under the shade of the mast arch and admire the tiger’s eye stone bar. 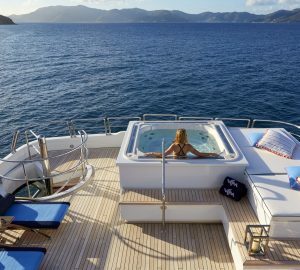 The 12 person Jacuzzi is definitely a must to enjoy life to the full sailing on the ocean waves. It’s surrounded by sun pads and shaded when the hydraulically operated sunroof is closed. Another lounge can be found on the main deck aft along with a swim platform. This platform is revealed by the lowering of a transom door. It also has a shower and day head, ideal when using the many water toys stored on board. A few of the exciting water toys for use range from jet skis, Seabobs, stabilisers, tenders and a fishing boat. For the more daring guests, why not take to the seas on a flyboard, kite surfer, wake board, paddle board or wind surfer? There’s also snorkelling equipment and amazing inflatable toys for adults as well as children. This spectacular superyacht makes for a fabulous charter vacation especially with its Art Deco interior and many unique design features. Children are well catered for as well as adults who wish to relax or want a bit of action. Nothing is ever too much trouble for the amenable crew and captain. Once on board if there’s anything extra you require, specific places you would like to visit, don’t be shy, just ask.